You are currently browsing the tag archive for the ‘verge gardens’ tag. What a positive change to this section of Unwins Bridge Road. Street trees and verge gardens on both sides of the road! I was hopeful that street trees would be planted too. Well, my wish was granted. 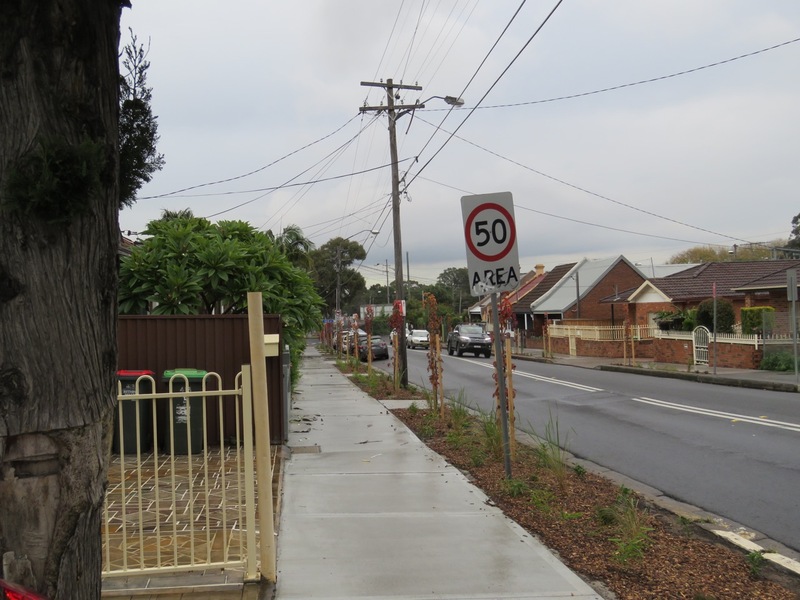 Not only has Inner West Council planted street trees, but they planted a lot of them in just one block. I think this is the largest number of new trees planted in one block that I have noticed since starting this blog. Twelve Ornamental pear trees have been planted on the eastern side & seven on the western side of Unwins Bridge Road. This is the species Council are planting along Unwins Bridge Road. You may have noticed that many of our high traffic roads are lined with Ornamental pear trees. I think it is because they are so robust & can tolerate poor growing conditions. They create a fairly dense canopy, so will provide a good pollution barrier between the traffic & the houses collecting some of the particulate matter from passing vehicles. They should also help muffle some of the traffic noise & cool the street as well. The trees will also add beauty to this section of Unwins Bridge Road that was previously dominated by concrete for what seems like forever. The change is quite striking even at this early stage after planting. Imagine how it will look once everything has grown. 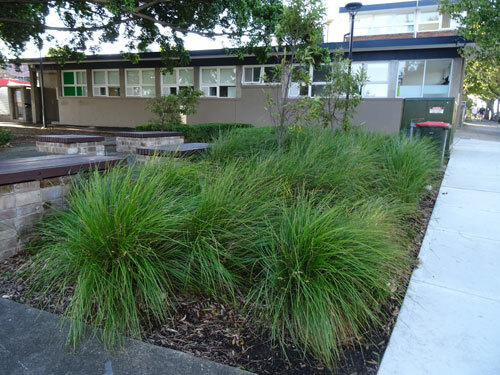 Council has planted a variety of plants from native grasses to native violets & other small plants. These too will help manage air pollution, add beauty & cool the area down. 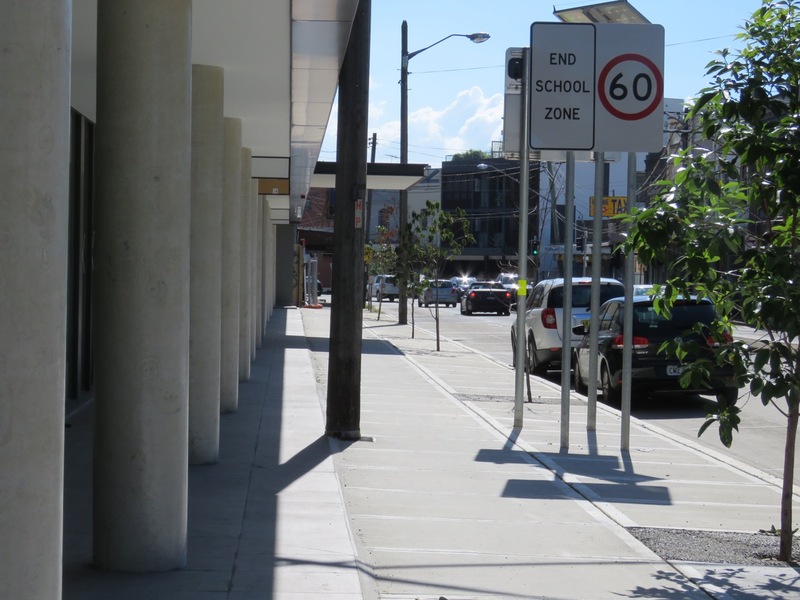 I applaud Council for doing this work & for choosing to plant street trees in that location. The trees will work to improve the air quality for local residents who have to tolerate massive amounts of traffic passing by seven days a week & the associated pollution. If all our heavy traffic roads could also have the same treatment, this will help improve the health of the residents now & into the future. More & more research is finding that street trees have a considerable impact on the health of the community, so the more our urban forest increases, the better it will be for all of us. Showing the western side of Unwins Bridge Road. Quite a range of plants in the verge gardens. This is the eastern side of Unwins Bridge Road Tempe looking toward the roundabout at the corner of Gannon Street. I think verge gardens will make a huge difference to the streetscape. 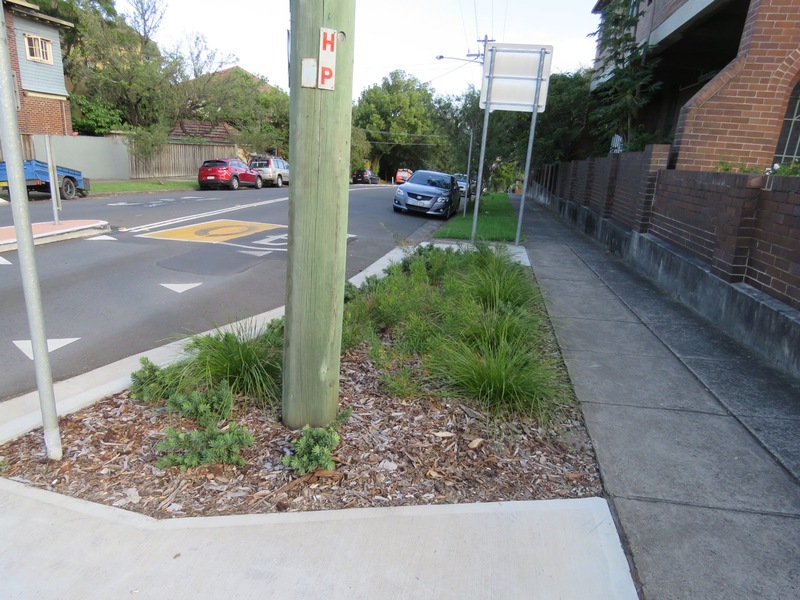 I was pleased to see newly created verge gardens along both sides of Unwins Bridge Road from Tramway Street to the corner of Gannon Street Tempe. This is one of the gateways to our area with thousands of vehicles travelling past every day. The houses are lovely, but the streetscape is not. Verge gardens will be a boon to the residents who will benefit from a drop in the urban heat island & the addition of beauty. The verge gardens also put something between pedestrians & the vehicles, which is excellent as so many of the pedestrians are school children. I am interested to see what Council plants & whether any street trees are included. Council has planted ornamental pear trees further up the road from Tempe High School all the way to Tillman Park, so there is a chance street trees will be planted here. Well done Inner West Council. 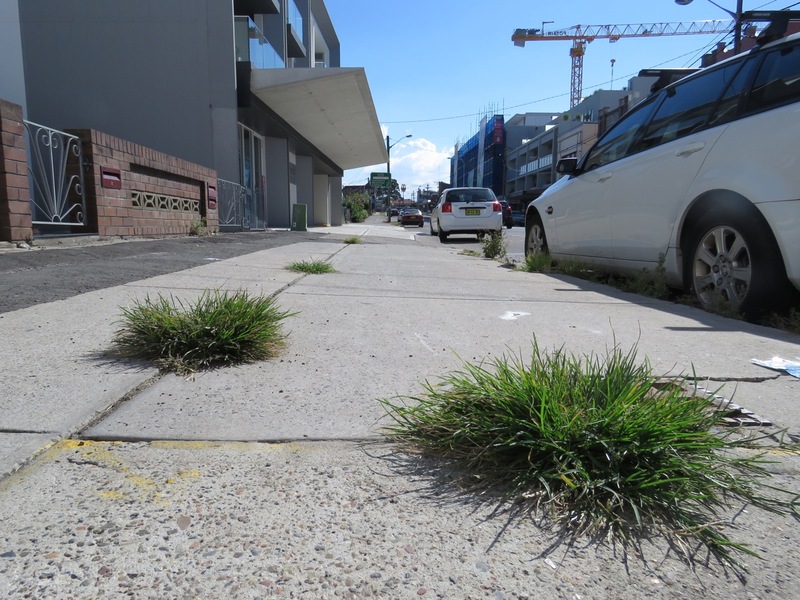 The creation of verge gardens is transforming streets across the former Marrickville municipality & I think it is great that attention is being given to Tempe. Southern side of Unwins Bridge Road Tempe, again looking toward Gannon Street. Even small verge gardens improve the streetscape. 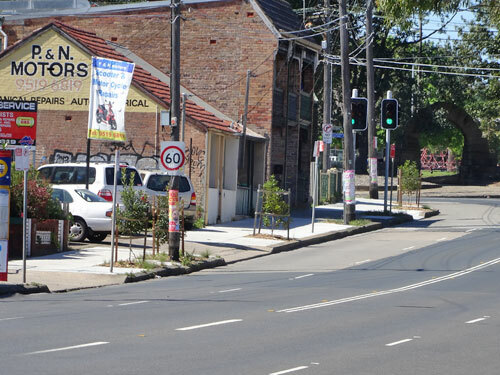 No street trees is a feature of New Canterbury Road Dulwich Hill. The new development in view did not include street trees, though they did include concrete. 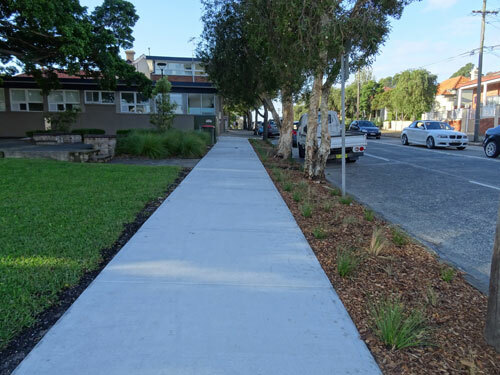 New concrete – no street trees. Is this the best this will look? 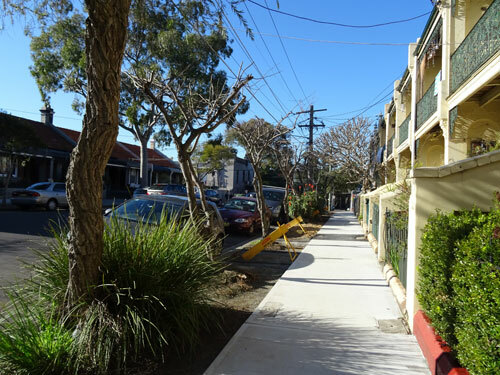 This new development in New Canterbury Road Dulwich Hill at least put in street trees. I find the power pole in the middle of the footpath odd. 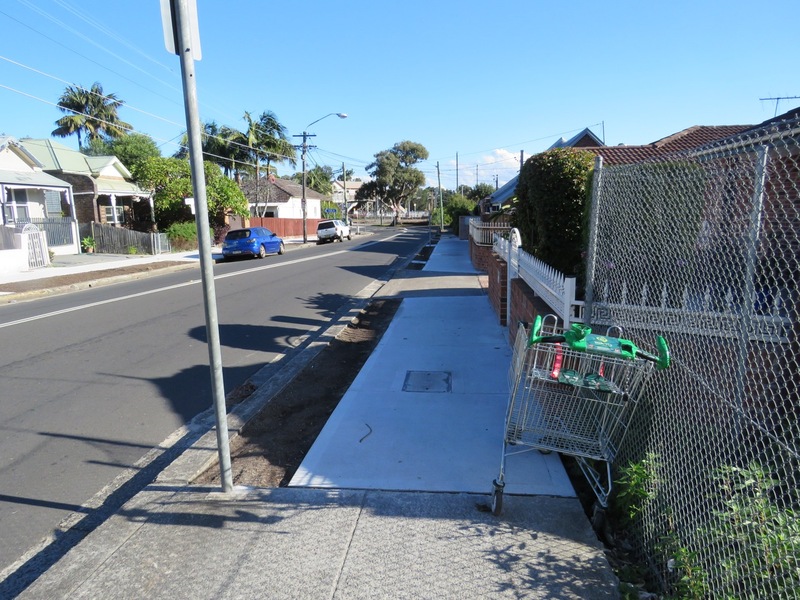 We cycled up New Canterbury Road Dulwich Hill last week & were surprised at the large developments happening there. Our area is changing fast. One of the high-rise blocks has four Brushbox trees planted out front, though one is already dead. 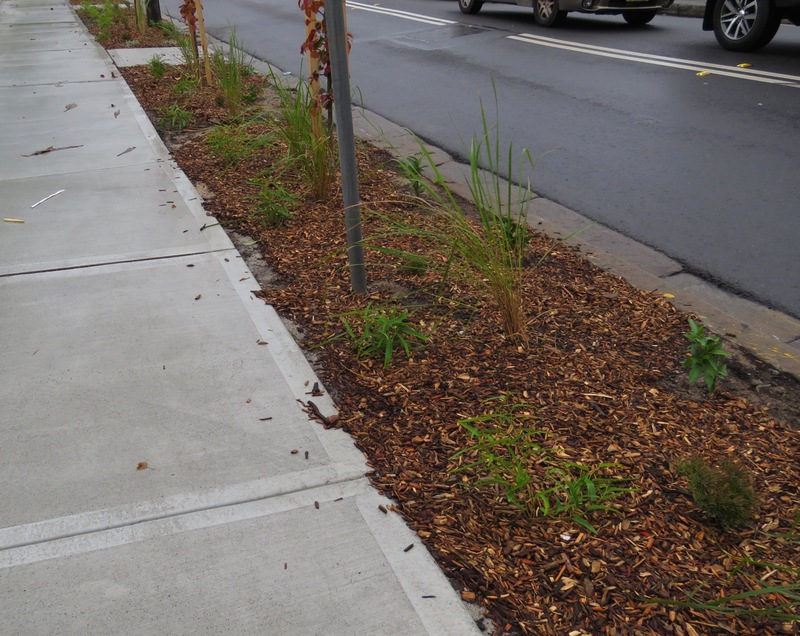 Street trees of this kind will enhance the streetscape and keep the footpath area cool so I am glad they were planted. The other high-rise building has no street trees, just a long expanse of brand new concrete. If this is going to be the future look for New Canterbury Road, then I think it is a missed opportunity. 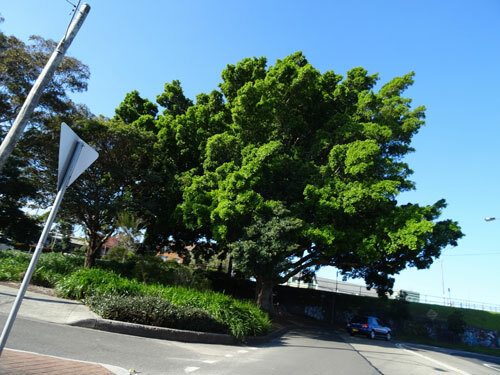 Inner West Council needs to insist that developers include a decent number of street trees as part of the development & dare I say, verge gardens. There certainly is room enough for them. When NSW Transport built the light rail stations, they did not stop at station infrastructure. They also planted trees & other plants extensively both inside & around the light rail stations & made these places quite attractive. 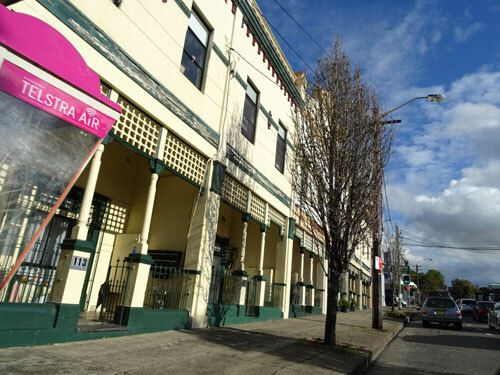 It is this that I would like to see developers do when they build a new building for the area – to look at the streetscape surrounding & especially in front of their development. What they don’t spend in concrete, they can spend on street trees & plants. I learnt from listening to the architect for The Revolution in Marrickville that if something “green” is not mandatory, then they don’t bother to include it in the development. 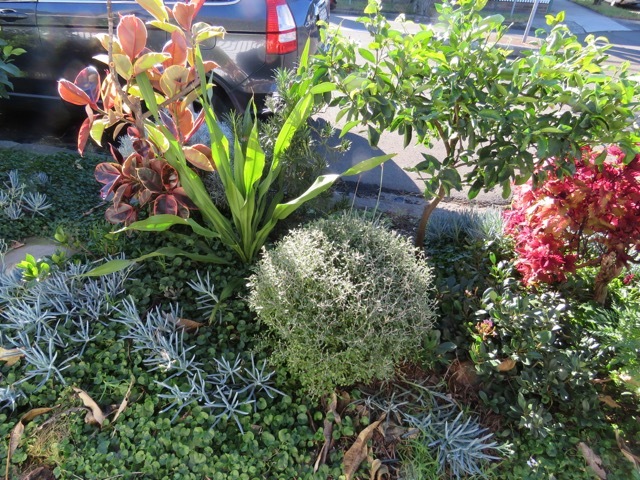 More & more around Sydney I am noticing busy roads including verge gardens & it all works well. With climate change starting to really make its impact & with three heatwaves already this year, development needs to change into something that assists the community. Concrete does not cut it anymore. We know too much about how great expanses of concrete is bad for us & exacerbates heat. Brilliant awning in Waterloo. Just a small change allows the community to have tall street trees. Such a sensible idea. 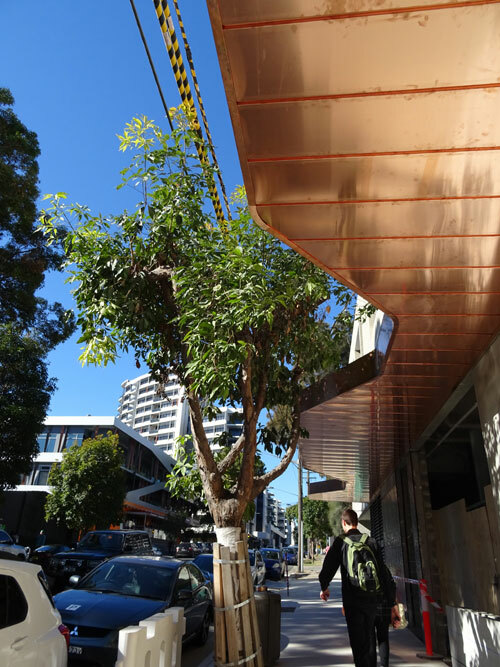 I also think Council should make it mandatory to have street side building awnings to be of the kind that has cutouts to allow the canopy of a street tree to grow & gain height as is the norm all along the Princes Highway in North Sydney. They have tall Brushbox trees growing along their business/shopping strip & all the trees have space for their canopy to grow. It looks good & not only that, it is sensible. I’ve also seen this in Waterloo. Why can we not have this in our area? 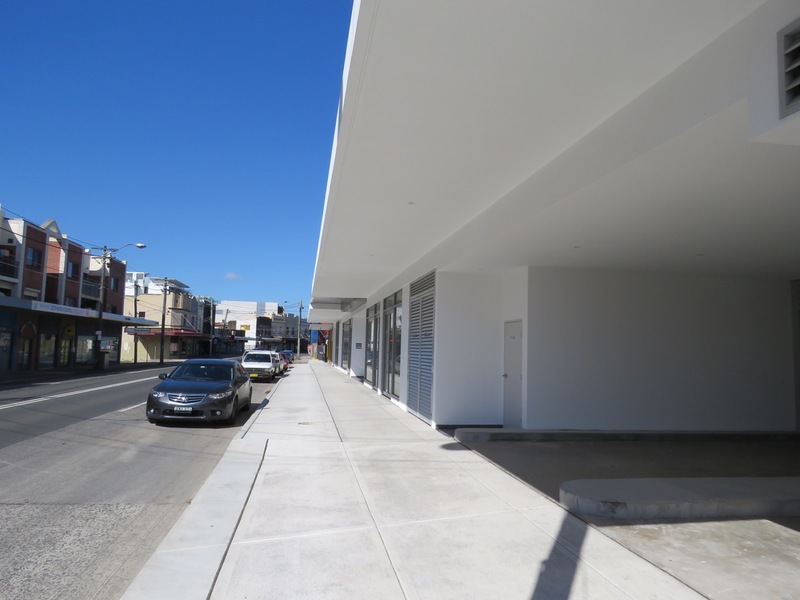 Further down closer to Dulwich Hill shops – New Canterbury Road Dulwich Hill is barren in many places. To end on a positive note, I very much like the new verge gardens on both sides, corner of Myra Street & New Canterbury Road Dulwich Hill. Council narrowed the road to add gardens and slow down traffic. They have planted Callistemon ‘Little John,’ which is a fabulous plant. It looks terrific. 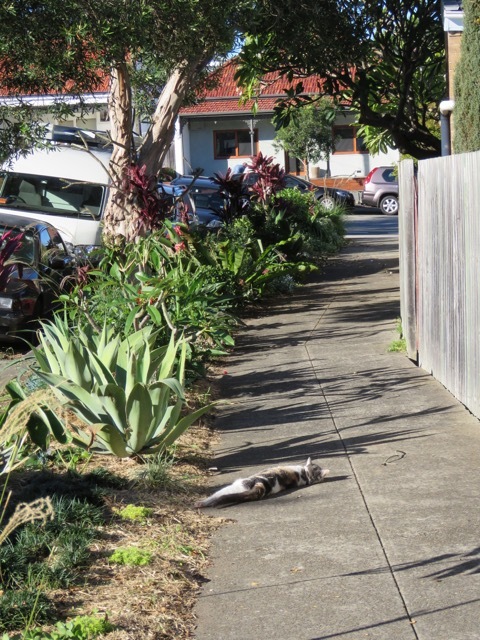 What a beautiful space made even nicer by a very sweet cat doing rolly-pollies on the footpath. I was told of a verge garden in Gould Avenue Lewisham that “would blow my mind.” So around a month ago we went to have a look. I went via Wardell Road, turned the corner with a pine hedge on my left & there it was – a most impressive verge garden. My first reaction was to stop & stare. Last weekend we were in the area again, so decided on a second visit. Since our first visit another 5-metres of grass had been removed extending the verge garden along the full length of the property. New plants were in the ground, including dwarf mondo grass planted to spell “Lewisham” – a very nice touch. I liked this a lot. I estimate the length of the verge garden to be around 20-metres, maybe a bit more. There is one street tree, a quite attractive watergum. Pavers have been installed at regular intervals to create a path from the footpath to the road for pedestrians & people exiting vehicles. Native violets have been planted as a ground cover around the pavers, keeping the area green, but not creating obstacles with plants. The range of plants used is extensive. There are ground covers, low shrubs, tropical colour, succulents, native grasses, poinsettias providing a burst of red, plus a whole lot more. The attention to detail is lovely with foliage of grey, silver, green, burgundy, lime green & even variegated foliage. Between the tall hedge edging the front garden & the very attractive verge with some shade from the street tree, this is a very nice place to be. We were there mid afternoon, so benefited from the shade created by both the plants & the street tree. While we were looking around, quite a few people walked past & all of them looked at the garden. This verge garden is an excellent example of how plants on the verge can radically improve the streetscape. It is a beautiful space. Maybe if more of our streets get transformed into gardens our community will come out of their houses more like they used to do in decades past. I could easily sit on a deck chair on the footpath & read or chat with others for the afternoon. Plus, a very sweet cat came out to say hello & scrounge a tickle, so she would only add to the experience. Well done to whoever created this garden. Your work is an inspiration & benefits local wildlife, of which I am sure some live there. It also benefits the local community & anyone fortunate enough to come across it like we did. A small section showing the variety of plants. ‘Lewisham’ written in dwarf mondo grass. This is in the newly planted area. Lovely. 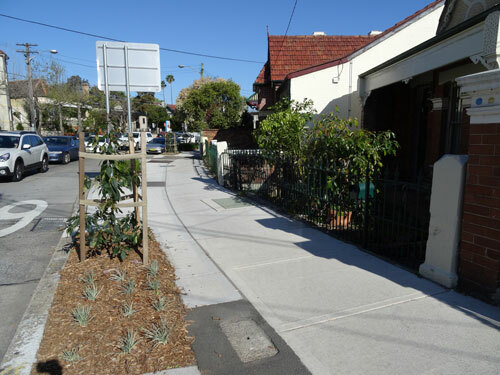 Marrickville Council created new verge gardens on both sides of Dickson Street Newtown. Recently these were planted on a community planting day. It looks great. I’ve just spent a very interesting block of time using the new ‘Trees and Health App’ designed by ‘The Healthy Trees, Healthy People’ program at Portland State University in the USA. 13 cities of the United States are covered in this app with more cities planned for the future. “How do different canopy designs (type, composition, distribution, and location of vegetation) improve air quality and reduce the heat island formation in urban landscapes? Which canopy designs are best for reducing the incidence of acute respiratory illness in neighborhood residence most exposed to air pollutants? The first function of the app, ‘Access’ shows the vulnerability to poor air quality in any neighbourhood. The map has colour gradations that allow you to have an overview at a glance, then, go to any area you choose for more information. Sliders filter neighborhoods by value. You can even ask the app to show you the worst neighbourhoods in terms of lack of canopy cover. The second function, ‘Prioritize’ allows you to get further details regarding neighborhood vulnerability statistics. It also allows you to find the areas that most need trees. The third function, ‘Plan’ allows you to set a tree-planting goal in either a particular neighbourhood or to increase the current canopy cover. You can even choose whether you plant trees that are small, medium or large at maturity & whether these will actually allow you to achieve your goal. The app will also tell you how many trees you need to plant in any particular block or neighbourhood. You can even go further into an area by getting the app to break it down to street blocks. All the information can be printed off into a jpg, pdf or exported in ESRI Shapefile format. This is a basic overview of what the app can do. It provides way more information than I have covered, but you can read more & use the app yourself by going to their internet page. I most certainly recommend doing this, as it is a unique experience that will have you thinking about our own canopy cover. One can only hope that this app is purchased for use in Australia as many local councils could benefit greatly from this remarkable app. The days of saying, “We have (insert number) thousand street trees” is over. This information is stuff of the past. Thanks to the many researchers who have studied the urban tree canopy, we now know that the health impacts are significant, the cost the community is significant, as well as ongoing & that poorer areas have less street trees & less landscaping. I have often wondered whether the lack of street trees & pleasant landscaping in poorer areas is a choice by local councils to attempt to keep some suburbs more affordable. 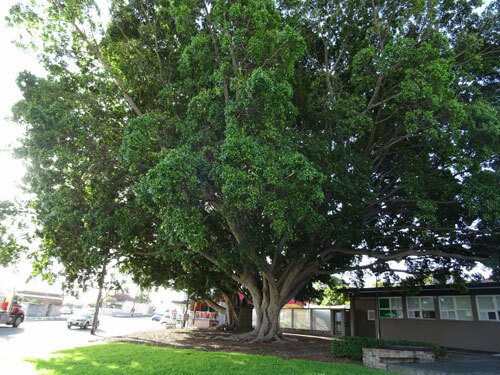 One of the last Hills Fig trees outside of parks in Marrickville LGA. I think it is a perfect planting in this space at Edinburgh Road Marrickville because there is plenty of room for the tree. I alos like that there are large garden beds on both sides of the road. Ornamental pear trees along Crystal Street Petersham. In my opinion these provide very little benefit or impact to the streetscape. 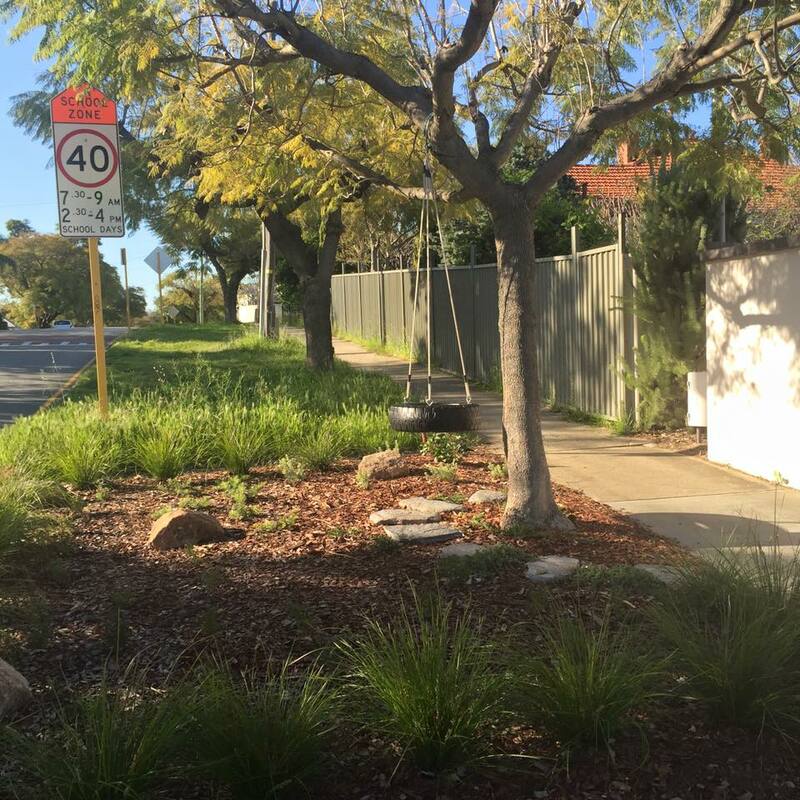 This verge garden runs from the corner of Gleeson Avenue along Unwins Bridge Road right to the building. Looking down toward the corner. 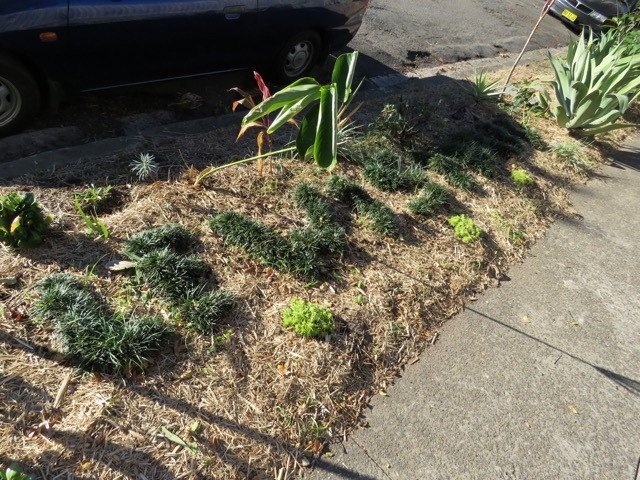 I was really pleased to see that Marrickville Council has recently replaced a stretch of footpath beside Memory Reserve on Unwins Bridge Road Sydenham & created a verge garden. They planted grasses & to me, this kind look good. The grasses also match the work done just inside Memory Reserve. They will visually soften this area. The same species of grasses just inside Memory Reserve. I often see people sitting in this park. These 65-year-old Figs in Memory Reserve are incredibly important trees in this area, which is full of hard surfaces. 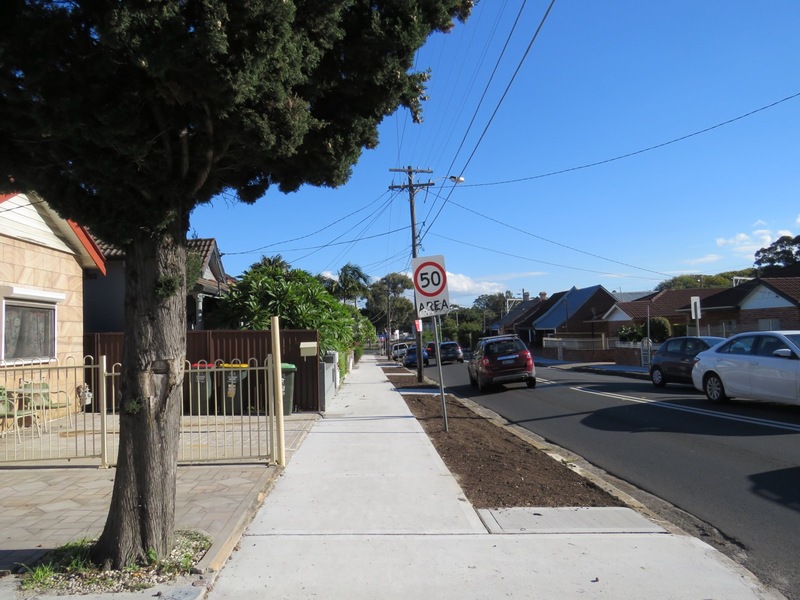 Four new street trees & verge gardens on Victoria Road, opposite Edinburgh Road. 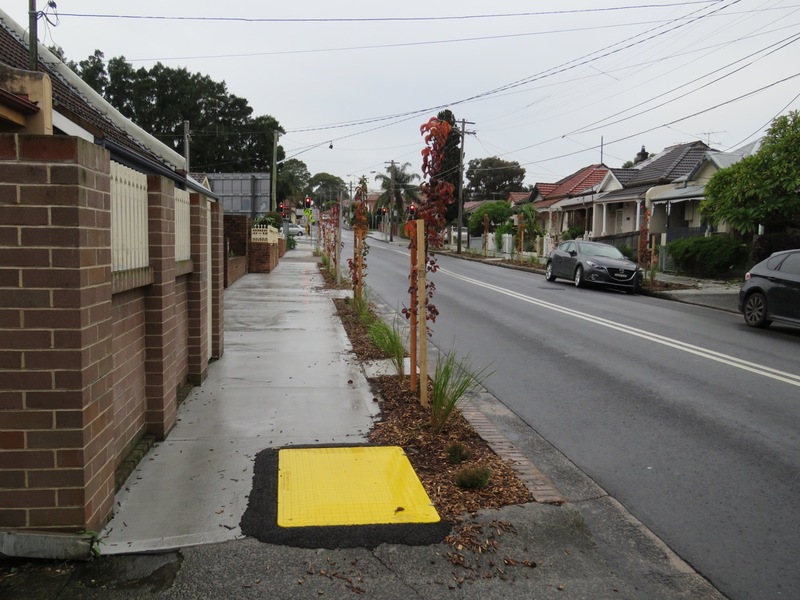 These will make a huge improvement to the streetscape. 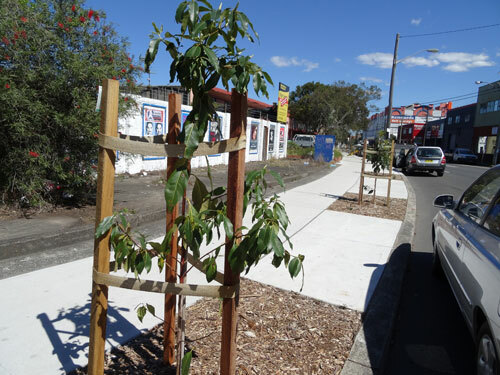 About 6 new Queensland Brushbox trees, plus verge gardens along Victoria Road Marrickville. 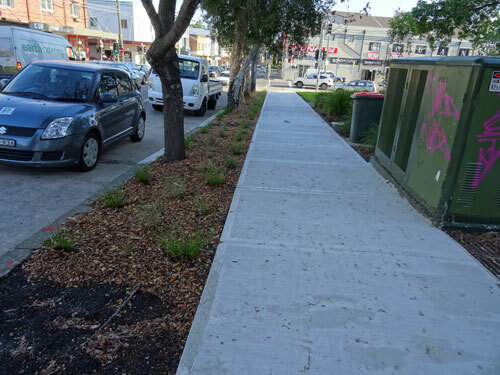 Marrickville Council planted 430 new street trees this 2014 planting season, 130 more trees than last year’s planting season. Every new street tree is a boon in my opinion, but some of the places Council has planted trees is an extra boon. 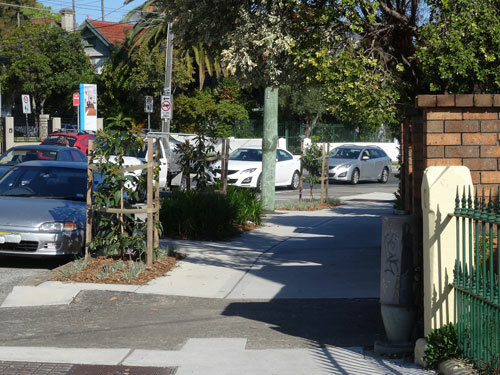 I was very pleased to see that Victoria Road Marrickville has been planted with many new street trees & verge gardens installed. 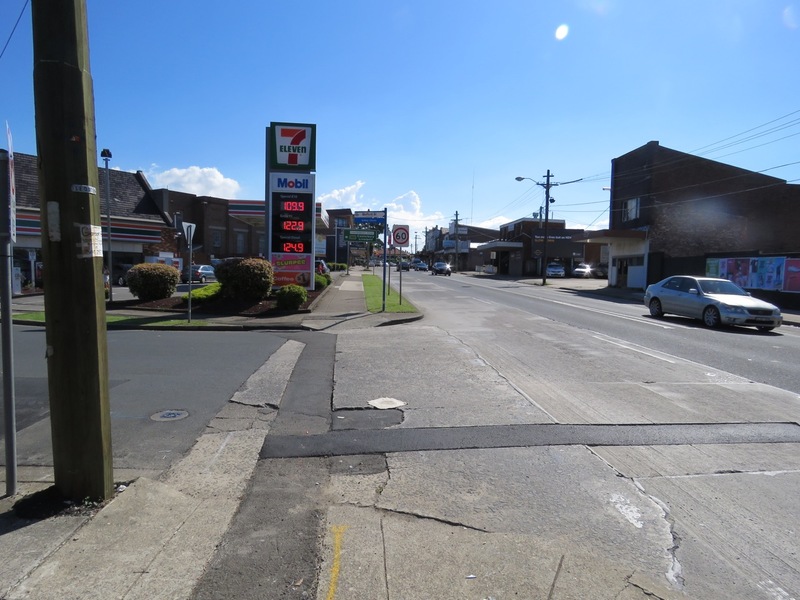 Trees were much needed in this area & they will improve the visual outlook of the streetscape. I was also pleased to see that four Queensland Brushbox trees have been planted almost opposite the Beynon & Haywood building on Livingstone Road Petersham. These also have verge gardens. Both sites look improved already. In a few years they should look really lovely. And more at the corner along Livingstone Road. My propagated plants from when I did the workshop last May. All, but one plant survived & I now have many more propagated plants in pots around the garden waiting to grow up. You won’t be disappointed if you do this workshop. Marrickville Council is holding a free half-day propagating workshop. A teacher from Ryde TAFE will deliver the workshop. There are still vacancies for this Saturday 25th October 2014. I’ve done this workshop & loved it. 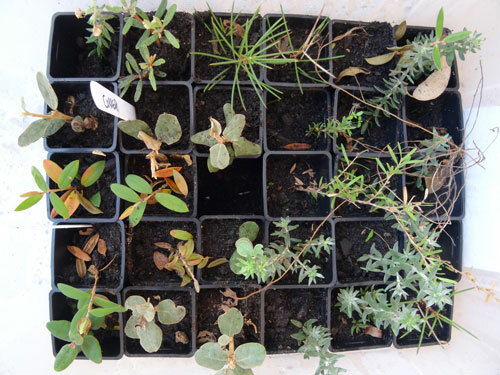 See – http://bit.ly/1k1Qvvq I learnt a lot & gained confidence in propagating native plants. If you have a particular native that is doing well in your garden, this workshop will help you learn how to propagate clones for your garden, verge and/or to share with friends & neighbours. Propagating also helps save lots of money. WHERE: Marrickville Community Nursery, Addison Road Centre, Addison Road Marrickville. Afternoon tea supplied, plus course notes. BOOK: by calling Council 9335 2222 during business hours. 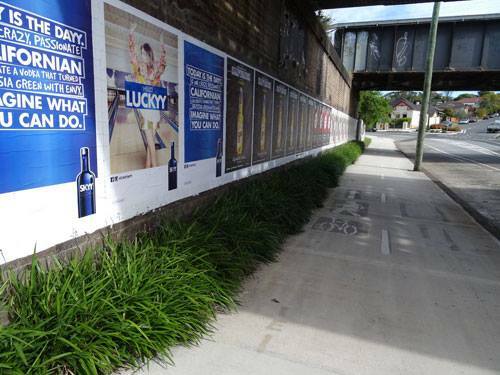 The planting of this strip under the rail line along Victoria Road was a great initiative by Marrickville Council. They only did it a year ago & with some hand watering, look at it now. It used to be filled with weeds & litter. Now it is a corridoor for lizards. A shocking article in The Guardian today of research findings by scientists from the World Wildlife Fund & the Zoological Society of London called the ‘Living Planet Report,’ which found that 50% of wild animals on this Earth have been lost in the past 40-years – that’s since 1974. The cause of such astronomical loss has been unsustainable hunting for food, habitat destruction & pollution. With development charging ahead, an ever-increasing human population & climate change starting to bite, these numbers will be increasing dramatically & soon, unless we make specific choices to act to prevent any further loss & take immediate & meaningful action to support the remaining wildlife. Obviously retaining & protecting forests is of paramount importance, but so is increasing the areas of real habitat to support biodiversity in urban areas. 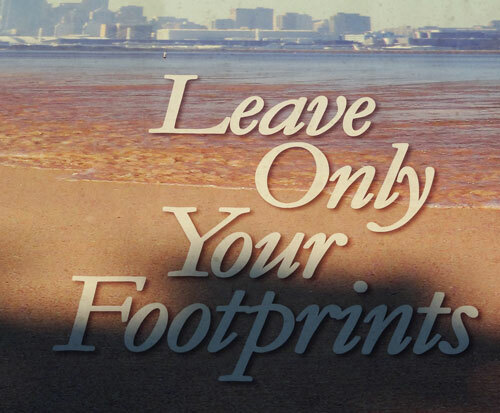 Australia was rated number 13 in the Top 20 Countries with the Biggest Ecological Footprint. Kuwait Number was number 1, the US was number 8 & the UK number 20. Rivers were the hardest hit with animal numbers plummeting by 75% since 1970. Just one more reason why we need to do whatever we can to restore & protect our own Cooks River. We can all take responsibility & make choices to do what we can to prevent further species loss. The following are some of the more obvious, but if we all did these, the impact would be profound & it would help our planet & the species that live here with us. Buy local food in season, even if it costs a few cents more. Grow food if you can. Buy or make your own reusable shopping bags. Marrickville Metro has a sign in the car park that says they go through 2,600 disposable plastic bags per week & this is just one shopping mall. Choose to buy products that have less packaging. Reuse & recycle as much as you can. Make you own compost, as this diverts an enormous amount of organic waste from going to landfill. Don’t buy products that contain palm oil because these mono forests are causing massive loss to species dependent on forests, such as the orangutans, elephants, tigers, rhinos & birds. Buy sustainably resourced timber & don’t support those companies that log old growth forests. Plant something native in our garden & start up a verge garden if you can. Every bit of space we green up supports wildlife, even if it is only insects & reptiles. Don’t plant invasive species & never dump unwanted plants in or near bush land. Do not disturb logs & bush rocks, as these may be homes for wildlife. Don’t pick wildflowers, take away plants or vandalise trees. Desex your dogs & cats & keep your cats on your property & inside at night. Attach as reflector on your cat’s collar to alert birds & other smaller animals of their presence. Don’t dump pets or dispose of unwanted fish in the river or the toilet. Do not remove river oysters or dig for crabs in the Cooks River. You can buy bait cheaply at fishing shops. Don’t keep small fish caught in the river. Put them back to allow them to grow to adulthood. Take home all fishing line & string that can cause entanglements to birds & other creatures. Take home all rubbish & leave the environment as clean as you can. 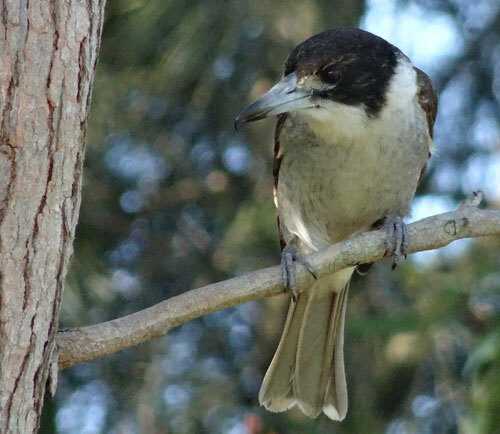 Grey Butcherbird. The more we green our environment, the more we support greater biodiversity. A wonderful anti-litter sign at Cooks Park at Dolls Point.